Much has been mentioned regarding the unfortunate disappearance of historical sites of religious significance in Saudia Arabia. 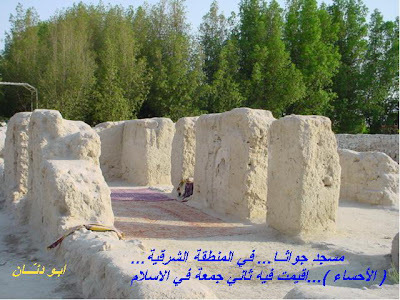 One such place which still remains (in some form atleast) is the masjid where the second Juma of Islam was performed. The place is called ‘Jawatha’ and it is located in the area of al-Ahsa in Saudia Arabia, a relatively short distance from the city of Hofuf (also referred to as al-Ahsa by locals). The first Jumua prayer which was offered after a Jumua prayer offered at the mosque of Allah’s Messenger (Allah bless Him and give Him peace) took place in the mosque of the tribe of ‘Abdul Qais at Jawatha in Bahrain.